Ambrane brings the range of innovative devices, with the launch of its first rugged Power Bank WP11 exclusively designed for the Adventure Traveler. Designed for outdoor enthusiasts and suitable for every backpack or emergency kit, the 10050mah Rugged Outdoor Power Bank offers double the power for those who need as much juice on the go as possible. With the IP67 certified rating, the Power Bank can be submerged up to 1 meter for 30 minutes with the waterproof lid closed.Further, it comes with 360-degree shockproof exterior and is also dustproof. The Power Bank comes with Dual output USB ports that offer 2.4A and 1A power and 2A input.It also has an efficiency of 85-90 percent, & automatically adjusts output based on the device. The ultra large capacity of power can full-charge your iPhone on an average 3-4 times, sufficiently enabled for talk time and support with multimedia devices, along with the ability to withstand 300 power cycles in its lifetime beginning a new battle in Power! In shades of Blue with a rubberised finish, the power bank brings firm grip and thus prevents from dropping in btw your SOS situations. BIS Certified, the power bank equips a multitude of advanced safety features – Short Circuit Protection, Over-charge Protection, Over Discharge Protection & Over Voltage Protection, that assures maximum user and device safety at all times. The product is already available with leading retail and e-commerce stores in India. 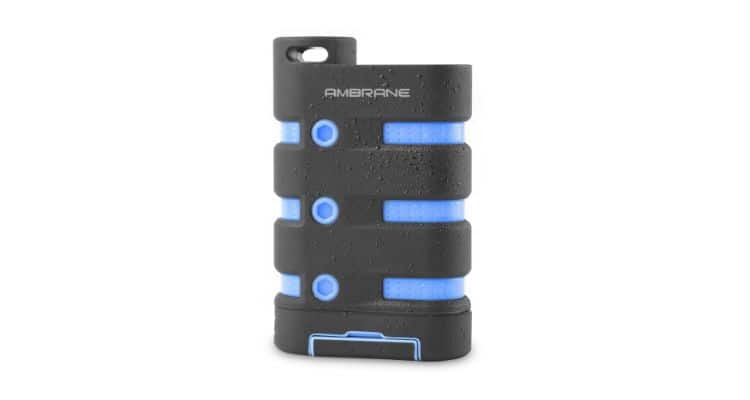 Ambrane Introduces ‘Rugged Power Bank’ WP11 for the Adventure Traveler 0 out of 5 based on 0 ratings. 0 user reviews.